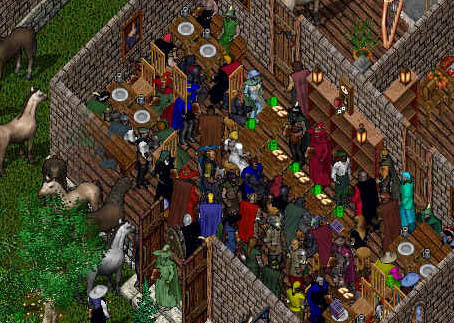 Description: The Spiritwood Tavern is open every Thursday at 8pm UK Time where you have the chance to take part in several fun games and contests. The tavern floor of the new tavern in Trammel. The old tavern in Felucca. The famous Spiritwood Tavern is located in the southern parts of Spiritwood, just east of Skara Brae. Founded and run by Fenris, the Spiritwood Tavern is a place where people can meet, enjoy an ale or just relax. Friendly and competent bartenders will look after the needs of a weary traveler. The bartenders are also a great source of information as is Shelby the Town Cryer, just outside the Tavern.